arguably one of the most well know international festivals worldwide has announced it’s line-up. 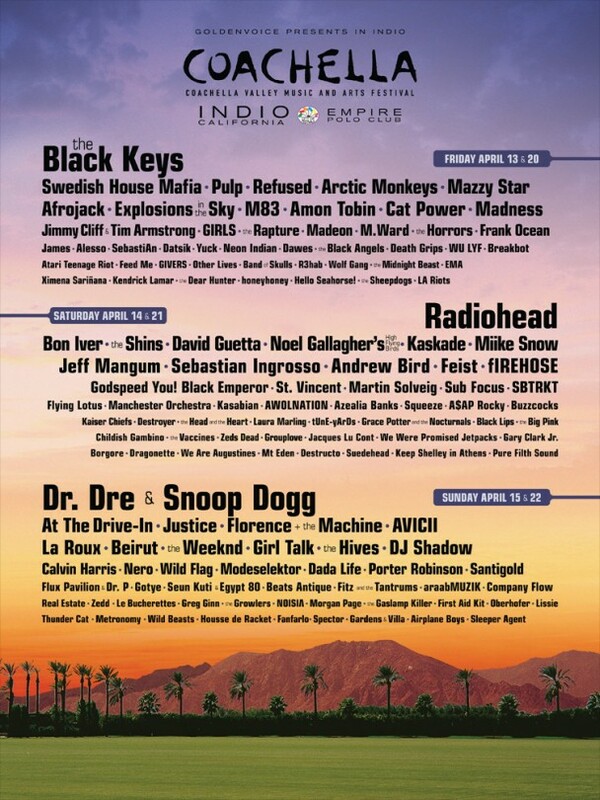 To proceed Kanye, Arcade Fire and Kings Of Leon last year, it’s managed to pull out some more massive names. Bon Iver, Madness, Florence And The Machine, Justice, Arctic Monkeys and The Horrors, Calvin Harris, Nero, Swedish House Mafia, Frank Ocean, Noel Gallagher’s High Flying Birds are the other main names to be playing. If you’re lucky enough to be able to even consider going, I have a whole lot of envy for you. Great line-up! Especially in a year without Glastonbury and Oxygen, it seems big acts are going to be more available this year? Who Will Be The Biggest Breakthrough Artist In 2012? As good as 2011 was in music, 2012 hints it might even top it. Slightly ignoring the BBC Sound of 2011 longlist – not because I’m a stuck-up, know it all music blogger, but because I’m a big fan of three artists in particular, and I’m sure will all have massive upcoming years. Hackney born, Maverick Sabre, is a real contender for best newcomer. 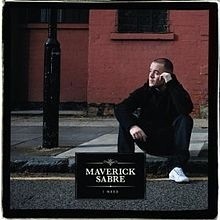 I say newcomer, but Maverick’s already had a big couple of years, with features on big tracks with Professor Green, Chase & Status and True Tiger, his ‘The Travelling Man’ mixtape – including ‘Sometimes’ ft. Wretch 32, a live performance on the Jools Hollans show, debut single ‘Look What I’ve Done’ from the ‘Lost Words’ EP, which reached number 2 on iTunes, after the first of two appearances on the Chris Moyles Show, where he performed a cover of Oasis’ ‘Wonderwall’ and on his second, more recent appearance, a cover of ‘Fairytale Of New York’ – both of which were absolutely stunning. If those highlights weren’t enough, he’s also released two further singles, both of which show the broad range of his talent. ‘Let Me Go’ and ‘I Need’ peaked at number 16 and 18 respectively. These two, and the upcoming single ‘No One’ are in the lead up to the hotly anticipated album, ‘Lonely Are The Brave’, due for release around early February. It’s an album which promises a lot, and I can’t see it disappointing at all. 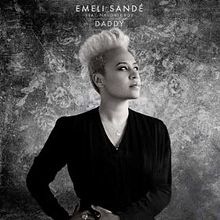 Another artist with a big 2012 ahead of them is the supremely talented, Emeli Sande. She first came to most people’s attention with her feature on Chipmunk’s, ‘Diamond Rings’, in 2009. Then again, in 2010, with her feature on Wiley’s, ‘Never Be Your Woman’ – both achieved the top 10! She also featured on Professor Green’s ‘Alive Till I’m Dead’ album opener, ‘Kids That Love To Dance’. But it was her second track with Pro that caught her the most attention, arguably, so far. ‘Read All About It’ was one of the biggest number 1 singles of the year, and it was a track where Professor Green went deep and personal, so the featured artist had to be a careful choice. Emeli was the perfect choice, her voice is just incredibly hair-raising – which added to the whole personal feel to the single. Obviously, it’s not just her featured work that’s got her the rightful attention. Her 2011 singles, ‘Heaven’ and ‘Daddy’ peaked in the charts at 2 and 21 – to be fair, I thought ‘Daddy’ deserved a position like ‘Heaven’ got, but wasn’t to be I guess. These were both in the build up to her debut album, ‘Our Version Of Events’, expected to be released in early February. But I think what shows her talent the best is her recent BRITS Critics Choice Award (Maverick came runner-up notably). This award has gone, in previous years, to Adele, Florence and the Machine, Jessie J – all of which, have had amazing recent years. What more could hint at her talents? Finally, in my big 3 to watch next year, Delilah. Singed to Atlantic Records since the age of 17, Delilah has most notably featured on the Chase & Status single, ‘Time’ – which she co-wrote with Chase & Status, as well as Plan B. Following the success of ‘Time’, Delilah joined Maverick Sabre on the Chase & Status tour. 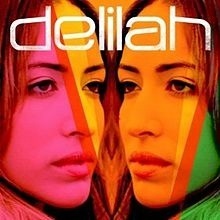 But much like Maverick and Emeli, Delilah has also released a couple of amazing singles in the lead up to her debut album. ‘Go’ produced by London duo, Ballistiq being the first. It incorporated lyrics from Chaka Khan’s ‘Ain’t Nobody’ – with added material from Delilah. Chaka actually described ‘Go’ as ‘genius’! Then the next single, the simply brilliant, ‘Love You So’, which proved her consistency to come out with stunning tracks. She’s also been included in the short-list for MTV’s ‘Brand New For 2012’ – which before, has featured the likes of Tinie Tempah, Lady Gaga, and Wretch 32! Maverick Sabre, Emeli Sande and Delilah all promise to have unreal success in 2012. Obviously there will be other artists that will have similar standards of achievement. But these 3 are my suggestions for you to really get to know – to be fair, most of you probably do, because I’m definitely not the first person to say this, but I won’t be the last!